Archive / There are 5 products. Timeless aromatherapy blends of true essential oils provide the composition of Archive's "Essentials" guest amenity range. 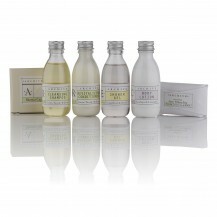 Refreshing fragrances housed in vintage inspired packaging delivers the look and feel your guests will enjoy. Recyclable packaging and soy inks provide an environmental benefit, while the larger bottle size enhances guest perception. * GRAPEFRUIT & NEROLI: Energising Shower Gel Restores tired muscles, an invigorating herbal infusion to your shower or bath. * GREEN TEA & WILLOW: Relaxing Shampoo/Conditioner The fresh, green fragrance compliments this gentle cleansing shampoo & revitalising conditioner. revel in this rich and delicately fragranced, restoring moisture to the skin.